Ready to take control of your health? Dr. Christopher Calapai returns with a list of foods that can drain your mental energy and focus. The board certified physician explains that the foods we choose have a lot to do with how sharp, attentive, alert, focused and happy we feel after they are consumed. Certain foods may taste great have additives in them that literally cloud our brains and leave us sluggish and dull headed. Just ahead, take note of three brain-draining foods to drop form your grocery list. There is zero reason to ever eat foods that list “partially hydrogenated oils” in their ingredients list. It’s code for trans fats, which, in addition to upping your risk for obesity and damaging your heart health, can cause serious brain drain. “Diets high in trans fats increase beta-amyloid, peptide ‘plaque’ deposits in brain associated with Alzheimer’s disease. One study published in Neurology found that people who consumed high levels of trans fats had lower cognitive abilities and smaller brains later in life,” says Dr. Calapai. Common culprits include fried foods, baked goods, and processed foods. So bake or grill chicken instead of frying it, go for sweet potatoes instead of French fries and avoid anything wrapped in plastic that sits on a shelf for months at a time. The average American eats 79 pounds of added sweeteners per year which can cause constant insulin spikes and inflammation resulting in both vascular and neuronal damage. One study published in Brain, Behavior and Immunity found that large amounts of sugar cause the hippocampus, the brain’s memory control center, to become inflamed, meaning it can’t work at 100 percent. Meanwhile, one cross-cultural analysis found that high sugar intake is linked to depression. 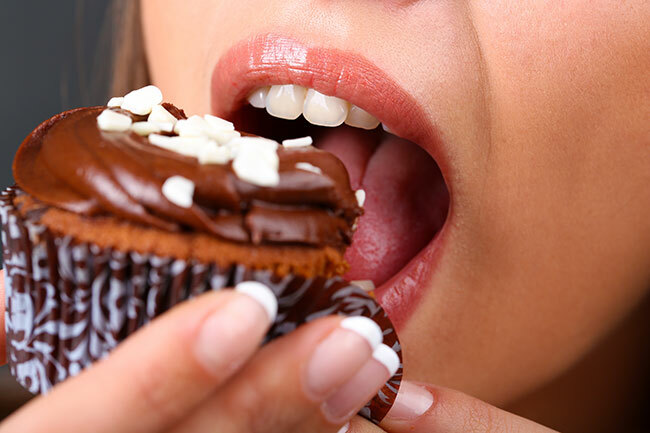 “Sugar is a big trap because when you eat something sweet there’s a high initially. It feels good at first taste but then once it starts to be processed in the body there’s a heaviness that follows, says Dr. Calapai. A diet high in saturated fat can decrease the brain’s ability to fight the formation of Alzheimer’s-linked brain plaque. An onslaught of saturated fat also hurts your brain in the short-term. Saturated fat impairs your brain’s ability to learn and form new memories within as little as 10 minutes after chowing down. Processed meats such as bacon, pepperoni, pork sausage, or chorizo are examples of very tasty foods that are high in saturated fat. “Look we all like to indulge from time to time and that is fine, but when saturated fats are staples in your diet, then that’s going to take a toll,” advises Dr. Calapai.